A skydiver who crashed last week in Northern California after a parachute malfunction has died. The San Joaquin County Sheriff's Office says 54-year-old Brett Hawton, of Alamo, was jumping solo from a plane out of the Lodi Parachute Center in Ocampo. The Sacramento Bee reports witnesses told Woodbridge Fire District officials that his chute tangled. The Sheriff's office confirmed Hawton died Friday, a day after he crashed and was hospitalized in critical condition. 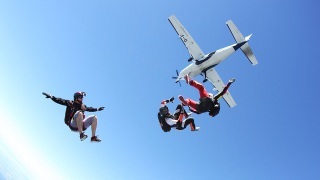 It's the second death this year of a skydiver who used the Lodi Parachute Center as a starting point. In May, 42-year-old Matthew Ciancio died when his chute failed to properly deploy at the end of a jump in a wingsuit, a specialized jumpsuit with two arm wings and a leg wing.